Jenkins certainly doesn’t shy away from letting his descriptive muse free 😉 We also meet such characters as Felix, the mad goalkeeper desperate to counter views that anyone could have stood between the Brazilian sticks, and Tostao, the intellectual who returned to a medical career after becoming disillusioned with the game. 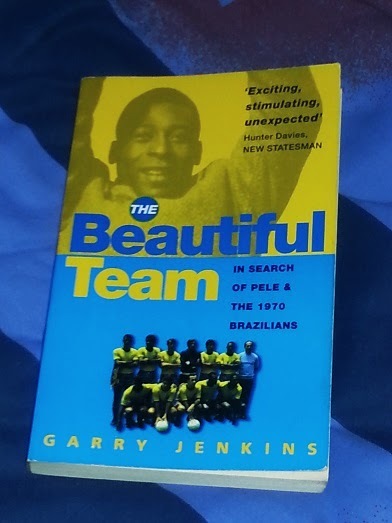 The Beautiful Team is a great read for football fans, but in comparison with All Played Out, it’s simply out of its league. Davies’ writing gradually increases the tension, creating a narrative that stands up to any work of fiction, but Jenkins constantly repeats himself, ignoring a wider narrative in favour of individual interviews. In addition, while Davies is analytical and insightful, weaving tournament, society, media and players into one absorbing story, Jenkins is more repetitive and doesn’t really do much more than say what actually happened. I’m not sure if Jenkins ever read All Played Out, but he could have picked up a few tips if he had.